Russell & Norvig 2003 (主張"理性智慧體"的概念)其中寫道"完整智慧體的觀念現在已經在領域內被廣泛接受" Russell & Norvig 2003，第55頁 Russell & Norvig 2004，第43頁. ^ 別再讓機器人殺人！反對團體呼籲勿用人工智慧參與戰爭. 風傳媒 蕭喬雲 2015年10月22日 （中文（台灣）‎）. ^ Nils Nilsson（英語：Nils Nilsson (researcher)）寫道："Simply put, there is wide disagreement in the field about what AI is all about" （Nilsson 1983，p.10）. Russell & Norvig 2003，第2–3頁, who make the analogy with aeronautical engineering. McCorduck 2004，第100–101頁, who writes that there are "two major branches of artificial intelligence: one aimed at producing intelligent behavior regardless of how it was accomplioshed, and the other aimed at modeling intelligent processes found in nature, particularly human ones." Kolata 1982, a paper in Science, which describes McCathy's indifference to biological models. Kolata quotes McCarthy as writing: "This is AI, so we don't care if it's psychologically real". McCarthy recently reiterated his position at the AI@50（英語：AI@50） conference where he said "Artificial intelligence is not, by definition, simulation of human intelligence" （Maker 2006）. See also Template:See section. Among the researchers who laid the foundations of AI were Alan Turing, John Von Neumann, Norbert Wiener, Claude Shannon, Warren McCullough, Walter Pitts（英語：Walter Pitts） and Donald Hebb. 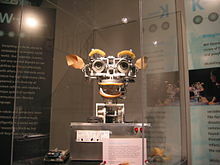 ^ The most dramatic case of sub-symbolic AI being pushed into the background was the devastating critique of perceptrons by Marvin Minsky and Seymour Papert in 1969. See History of AI, AI winter, or Frank Rosenblatt（英語：Frank Rosenblatt）. McCorduck 2004，第489頁, who calls it "a determinedly scruffy enterprise"
Luger, George. 人工智能：複雜問題求解的結構和策略. 由史忠植 等翻譯 原書第4版. 北京: 機械工業出版社. 2004. ISBN 7-111-12944-X （中文）. Nilsson, Nils. 人工智能. 鄭扣根等譯. 北京: 機械工業出版社. 2000. ISBN 7-111-07885-3 （中文）. Russell, Stuart J.; Norvig, Peter. 人工智能：一種現代方法. 由姜哲翻譯 原書第2版. 北京: 人民郵電出版社. 2004. ISBN 9787115122285 （中文）. Winston, Patrick Henry. 人工智能. 由崔良沂、趙永昌翻譯 原書第3版. 北京: 清華大學出版社. 2005. ISBN 9787302103271 （中文）. 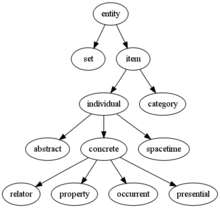 ACM Computing Classification System: Artificial intelligence. ACM. 1998 [30 August 2007]. （原始內容存檔於2007年10月12日）. Brooks, Rodney. Elephants Don't Play Chess (PDF). Robotics and Autonomous Systems. 1990, 6: 3–15 [30 August 2007]. doi:10.1016/S0921-8890(05)80025-9. （原始內容存檔 (PDF)於2007年8月9日）. .
Buchanan, Bruce G. A (Very) Brief History of Artificial Intelligence (PDF). AI Magazine. 2005: 53–60 [30 August 2007]. （原始內容 (PDF)存檔於2007年9月26日）. Dennett, Daniel. Consciousness Explained（英語：Consciousness Explained）. The Penguin Press. 1991. ISBN 0-7139-9037-6. Dreyfus, Hubert. What Computers Can't Do（英語：What Computers Can't Do）. New York: MIT Press. 1972. ISBN 0-06-011082-1. Edelman, Gerald. Gerald Edelman – Neural Darwinism and Brain-based Devices. Talking Robots. 23 November 2007. （原始內容存檔於2009年10月8日）. Hawkins, Jeff; Blakeslee, Sandra. On Intelligence（英語：On Intelligence）. New York, NY: Owl Books. 2005. ISBN 0-8050-7853-3. Kurzweil, Ray. The Age of Spiritual Machines（英語：The Age of Spiritual Machines）. Penguin Books. 1999. ISBN 0-670-88217-8. Lakoff, George; Núñez, Rafael E. Where Mathematics Comes From: How the Embodied Mind Brings Mathematics into Being（英語：Where Mathematics Comes From）. Basic Books. 2000. ISBN 0-465-03771-2. .
Lucas, John. Minds, Machines and Gödel. (編) Anderson, A.R. Minds and Machines. 1961 [30 August 2007]. （原始內容存檔於2007年8月19日）. Maker, Meg Houston. AI@50: AI Past, Present, Future. Dartmouth College. 2006 [16 October 2008]. （原始內容存檔於2008年10月8日）. McCarthy, John; Minsky, Marvin; Rochester, Nathan; Shannon, Claude. 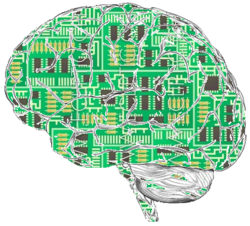 A Proposal for the Dartmouth Summer Research Project on Artificial Intelligence. 1955 [30 August 2007]. （原始內容存檔於2007年8月26日）. .
McCarthy, John; Hayes, P. J. Some philosophical problems from the standpoint of artificial intelligence. Machine Intelligence. 1969, 4: 463–502 [30 August 2007]. （原始內容存檔於2007年8月10日）. Minsky, Marvin. The Emotion Machine（英語：The Emotion Machine）. New York, NY: Simon & Schusterl. 2006. ISBN 0-7432-7663-9. Newell, Allen; Simon, H. A. GPS: A Program that Simulates Human Thought. (編) Feigenbaum, E.A. ; Feldman, J. Computers and Thought. New York: McGraw-Hill. 1963. Newell, Allen; Simon, H. A. Communications of the ACM 19 (3). 1976. （原始內容存檔於2008-10-07）. |contribution=被忽略 (幫助). Searle, John. Minds, Brains and Programs. Behavioral and Brain Sciences. 1980, 3 (3): 417–457. doi:10.1017/S0140525X00005756. （原始內容存檔於2010-01-18）. Serenko, Alexander; Detlor, Brian. Intelligent agents as innovations (PDF). AI and Society. 2004, 18 (4): 364–381. doi:10.1007/s00146-004-0310-5. （原始內容 (PDF)存檔於2012-03-01）. Serenko, Alexander; Ruhi, Umar; Cocosila, Mihail. Unplanned effects of intelligent agents on Internet use: Social Informatics approach (PDF). AI and Society. 2007, 21 (1–2): 141–166. doi:10.1007/s00146-006-0051-8. （原始內容 (PDF)存檔於2012-06-20）. Shapiro, Stuart C. Artificial Intelligence. (編) Shapiro, Stuart C. Encyclopedia of Artificial Intelligence (PDF) 2nd. New York: John Wiley. 1992: 54–57. ISBN 0-471-50306-1. Wason, P. C.; Shapiro, D. Reasoning. (編) Foss, B. M. New horizons in psychology. Harmondsworth: Penguin. 1966. Weizenbaum, Joseph. Computer Power and Human Reason（英語：Computer Power and Human Reason）. San Francisco: W.H. Freeman & Company. 1976. ISBN 0-7167-0464-1.